Can you believe it? We went to the Cardinal game last night and I was standing in the concession line with Bill. He ordered two beers, one for me and one for him, and the young man behind the counter looked at me and said, "Can I please see your ID?" I said, "Sure" and I laughed as I handed it to him. He looked and the ID and his eyes got really big and then he looked back at me and said, "Thank you." Hee hee hee...I should have said, "Dude, I'm legal age times 2 plus 4. I just act like I'm 12." It was a great game last night. The Cards won 5 to 4. Albert got a home run. The newest Cardinal, Joe Mather, got his first major league hit and RBI and he made an outstanding catch in right field for which the crowd gave him a standing ovation. The Cardinals sent Chris Duncan to Memphis yesterday and brought up Joe to take his place. Duncan hasn't been doing too well as of late so this was probably a good decision. Typepad, my blog host, seems to be experiencing some difficulties. It takes forever to create a post. They're working to resolve the issue but I may not be posting too many entries until it's resolved. Regular readers of my blog will know that I'm not a big fan of Anheuser Busch. Sure they know how to brew good beer but they choose to brew the fizzy yellow stuff (Bud, Bud Light) instead. I heard an Anheuser Busch commercial on the radio this morning. It said something like, "This isn't a wheat, a bock, a pale, a stout, a fruit beer or any of those fussy microbrews..this is the beer you love. Budweiser...blah blah blah." It cracks me up because they do brew a wheat, a bock, a stout, etc. That being said, the rumor is that Belgian based InBev NV is considering offering a $46 billion takeover bid for Anheuser Busch. This rumor has been flying around for at least the last three months but the latest news seems to be that this more than just a rumor. I wonder how this will play out. the day my mom and dad were married...51 years ago. I came along 5 years later so that makes me...hmm, well I was never good at math...hee hee hee...Anwyay. here's the card I created for them. I used the Fabulous Finds Cricut cartridge to create the little tag which I then adhered to the card with a brad. The photo corner was created with my @Stampin' Up photo corner punch. 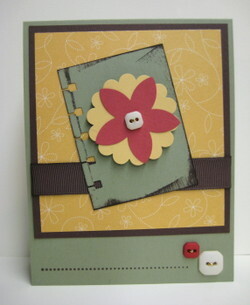 I loved how I used the two buttons on the card I posted on 5/19 so I used the same layout on this card too. We're going to go see the new Indiana Jones movie today and then hopefully the weather will hold out so we can bbq tonight. We ate at Llywelyn's in the Central West End tonight. I know it's been at least 2 years since we've eaten there. We were lucky enough to be able to get a table in the beer garden. Before tonight, I didn't even know that Llywelyn's had a beer garden! I think every time we've eaten there, it's been the middle of winter so I guess the beer garden wasn't an option...hee hee hee. Anyway, for the appetizer, we ordered the fried pickles (hey Jenny, are you reading this?). Bill had the Llywelyn's broil and I had the pub burger...yum! Llywelyn's has quite a few beers on tap as well as a wide variety of bottled beers. I had the O'Fallon 5 day IPA. For dessert, I had the Young's double chocolate stout. This beer is actually brewed with dark chocolate...oh my goodness; beer and dark chocolate. Can it get any better? This is one of my most absolute favorite beers EVER! It tastes like coconut and chocolate with a hint of coffee. Bill even likes it and he's not a big fan of porter. Well, guess what? I just found out that 33 California BevMostores carry this wonderful brew. Until now, the only place you could enjoy this beer was in Hawaii. BevMo also carries the Big Swell IPA and the Bikini Blonde Lager. I love IPA's and Big Swell is definitely one of my favorites. Blonde lagers are not my first choice (think Budweiser) but the Bikini Blonde is one of the best. You can click hereto see a description of all of their brews. Since we will be in California in a few weeks, I've already checked to see which BevMo stores are close to our hotels. When we're I've found one in LaJolla which is near our hotel in San Diego and one in West Hollywood which isn't too far from our hotel in Santa Monica. The only problem is, it is not legal for an individual to ship beer via USPS, UPS, Fed Ex, DHL, etc. Retailers can ship to certain states and luckily, Missouri is one of those states but I have not been able to determine if BevMo will ship the Coconut Porter. I sent an e-mail to them asking if it is possible. If we can't ship a case or two (or three) back to us, I guess we'll just have to enjoy a few while we're there. The "Featured Stamper" on Splitcoast Stampers this week is Dawnsing. She is one of my favorite stampers. Her clean, fresh style is wonderful. She has had numerous cards published in various card magazines. She is currently on a Mediterranean cruise with her husband, lucky girl! I decided to take part in the Featured Stamper Challenge. The idea is to create a card based on one of the designs in the featured stamper's gallery, changing at least two design elements such as color, image, embellishments, etc. This is my take on one of her cards. I changed the colors, omitted some of the buttons and used the spiral punch instead of the tag punch. I really like how it turned out. You can view her original creation by clicking here. What a great weekend. Friday night, we went to Frederico's with my mom, dad, Lisa, Randy and the kids. Every time I eat at Frederico's, I order the chicken spedini. Absolutely the BEST chicken spedini I've ever had! After dinner, we went back to my mom & dad's house for a while. I bought more flowers yesterday. I planted the new flowers in addition to the ones I bought earlier in the week. We grilled veggie, chicken and chorizo skewers for dinner. Yummo. I bought and planted a few more flowers today. I think I may be finished buying flowers but who knows. For dinner, we grilled tilapia, zucchini and cherry tomatoes. We were going to grill potatoes too but I forgot to buy them when I went to the grocery store so I made rice instead. I had time to stamp last night and tonight and I made a few cute cards (patting myself on the back). I'll post them soon. We went to the Cards/Pirates game last night. Unfortunately, Izzy trotted to the mound in the 9th inning. My head started hurting, my palms started sweating and I felt nauseous. To my surprise, he actually did a fairly decent job last night. The Cards held on to win 5 to 1. Today was a totally different story. The Cardinals were winning 5 to 4 in the 8th, in came Izzy and our lead vanished. The Pirates scored 3 in the 8th and 4 in the 9th...losing pitcher; Jason Isringhausen. His current record is 1 and 5 with an 8.0 ERA. Yes, I said 8.0. Izzy claims that he is not injured so, if that is the case, he can't be placed on the disabled list. I say send him to the Minors. Former Cardinal, Jim Edmonds, was traded to the Cubs yesterday. Poor guy. Oh well, Chicago is a lot closer to St. Louis than San Diego is. Now he can visit his restaurant, F15teen, more often. We received another graduation announcement in the mail on Saturday. This is a high school graduation of a young man we've known since he was a baby, actually even before he was even born. I can't believe he's graduating from high school. Where has the time gone? For this card, I again chose the same colors as the announcement. I chose Night of Navy for the card base. 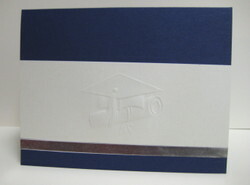 It is a little difficult to see in the photo but there is an embossed image in the center of the vanilla card stock. This was from the graduation announcement we received last week. The silver strip was from the latest announcement and made the photography a little tricky because the light kept reflecting off the strip. Click on the photo for a better view. Anyway, since this card is for a male, I didn't want it to be too fussy, you know what I mean? On the inside, I used card stock to cover a small treat bag I had bought at Hobby Lobby and then punched a half circle and attached it to the inside. This will be perfect for holding the gift card we are sending to him. I loved the result so much that I did the same thing with the other graduation card I made last week. I finally bought some flowers on the way home from work today. We're supposed to get some frost later this week so I haven't planted the impatiens in the ground yet. I just planted some in our large planter on the front porch and the rest will wait until this weekend. I'm just wondering if we're ever going to see spring.